ELIZABETH CITY, NC - Pope Francis will definitely be more in touch with his "rugged" side when he stops by the States for a visit. 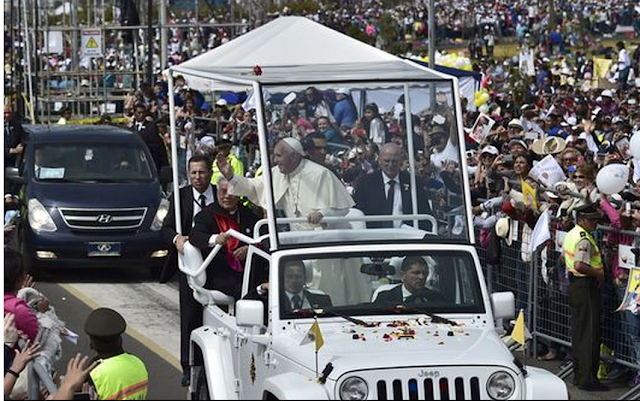 The Pope will be ferried in the Jeep Wrangler for his upcoming visit, comparable too a white one he used while on his last visit to Ecuador earlier this summer (shown above). The Vatican confirmed this just yesterday, to the delight of Jeep fans across the country. While Fiat Chrysler Automobiles, the Italian-American maker of Jeep, has not disclosed the configuration of the popemobile, the Vatican did say the Wrangler is already in the hands of the Secret Service and won't be on view before the Pope's visit in September. What we can view however, is the he white Wrangler used by the pope in Ecuador which had a glass-front roof with open sides, allowing the popular pontiff greater proximity to his flock than pope-mobiles of the past, which were typically closed, bullet-proof affairs.